November 7, 2016, 12:37 PM · In an effort to promote the coverage of live violin performance, Violinist.com each week presents links to reviews of notable concerts and recitals around the world. Sarah Chang performed Piazolla’s Four Seasons with the Calgary Philharmonic Orchestra. Calgary Herald: "Chang played as she typically does, with a complete command of the technical challenges and an effortless projection of the soul of the music. She is a compelling performer to watch and hear, and her musicianship moved the audience. From the vigorous, rhythmic elements to the sensitive melodies, Chang charmed and beguiled, the audience following every nuance." 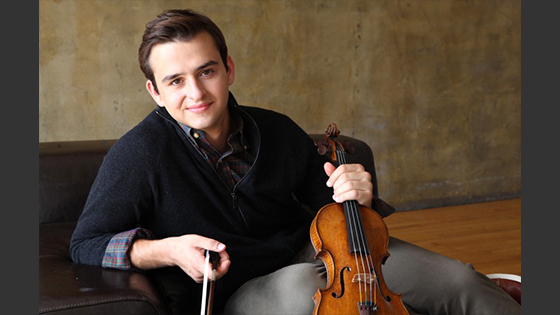 William Hagen performed Saint-Saëns’ Violin Concerto No. 3 with Tucson Symphony Orchestra. Arizona Daily Star: "Hagen was terrific. He has that confidence without a hint of cockiness that gives him license to take chances. And he has the technical chops to uncover every nuance no matter its subtlety of Saint-Saëns score and bring all the drama and beauty — especially evident in the lush second movement — to bear in a sound that is muscular, yet vulnerable. His performance was spectacular." Philippe Quint performed the Tchaikovsky with the Grand Rapids Symphony. The Rapidian: "His technique is masterful.... What’s more, he plays as a troubadour, spinning a story full of pathos and passion that has his audience hanging on his every word." Benjamin Beilman performed Prokofiev’s Violin Concerto No. 1 with the Florida Orchestra. Tampa Bay Times: "Think of a motorcyclist racing down the side of a mountain without a road or a path, and somehow staying upright. That's what it is like listening to Beilman play." Midori performed the Beethoven with the Philadelphia Orchestra. The Philadelphia Inquirer: "Whether you agreed with her or not, the intimacy she achieved in her performance was pretty rare, but, more important, she created a unique chapter in one's listening history with the piece. Something was clearly happening here in real time, and audiences rightly adore that." Ray Chen performed Bruch's First Violin Concerto with the Singapore Symphony Orchestra. The Straits Times: "Chen seemed particularly restrained in his playing of the gorgeous slow movement. What made this so effective, however, was the extremely soft dynamic levels he and the orchestra achieved. It was as if they were whispering sweet nothings into our ears. There is something beautifully touching about seeing so many people on stage producing so little sound." Joseph Swensen performed the Barber with the Oregon Symphony. Oregon Artswatch: "... his tone was fatally soft. Most of his notes were lost in the orchestral texture around him when they should have led the way." November 7, 2016 at 08:55 PM · I saw Augustin Hadelich play the Britten Violin Concerto with the Colorado Symphony on Friday night. He played a really musically satisfying rendition, and wasn't fazed by any of the technical challenges, with beautiful double-stop chromatic glissandos, double-stop harmonics, and a really flowing and beautiful tone. He also played a really beautiful Andante from Bach's 2nd solo sonata as an encore. November 8, 2016 at 06:15 AM · Thank you for sharing that, Christian - Hadelich is wonderful to see in live performance. Was there any review in the Denver Post? November 8, 2016 at 04:14 PM · I don't think so. I don't think anyone does reviews in Denver anymore. Probably to make room so that someone can finally adequately cover the Broncos. November 8, 2016 at 10:07 PM · Yeah, but the disappointing part was that Hadelich played from music score, which killed a lot of the magic of the concert, in my opinion. Also,since when can soloists play from a score in a concert???? November 8, 2016 at 11:26 PM · As much as my blood runs orange and blue for those Broncos, this is a sad statement on the town where I grew up! November 9, 2016 at 03:42 PM · I guess I can't say one way or the other what effect having the score there had on his performance. He never sounded unprepared, and it was positioned pretty unobtrusively. I can sort of see what you are saying, but out of the 20 so soloists I've seen with the Colorado Symphony, most of whom have not had a score with them, he's my favorite. November 10, 2016 at 04:04 AM · It's common practice for soloists to use music when performing later 20th century and earlier 21st century works.